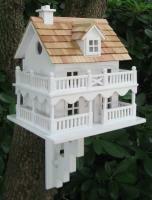 Pine shingles top this classic avian residence now available in a stunning blue. 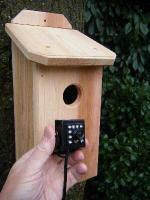 The fully, functional birdhouse features a removable back wall with a side entry hole to a single, unpainted nest box plus ventilation and drainage holes. 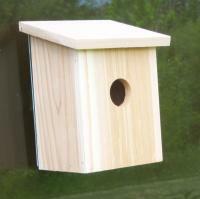 A convenient paddle-board attached to the back allows you to hang this beautiful birdhouse anywhere. Constructed of kiln-dried hardwood. 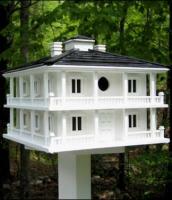 Avian Housing reaches new heights with our distinctive line of architectural birdhouses, bird feeders, and related garden accessories. Take a bird's eye view of our Victorian designs enhanced by authentic scrollwork and turn-of-the-century, cottage inspired embellishments. All of our birding products are designed for outdoor use in the garden or can be enjoyed in the home as a decorative accessory. Our birdhouses, birdfeeders, garden pedestals, and garden outdoor furniture will transform your backyard into a haven for nesting for many years to come. A Victorian Cottage birdhouse with miniature birdhouses in front, a Farmhouse birdhouse with an adorable potted plant on the front porch and the White House recreated as functional birdhouses with exacting detail are just a few of the spectacular garden decorations to be found at Home Bazaar. A solid wood, outdoor furniture group featuring a cottage bench, cottage chair, butterfly "Settee" bench, cottage tables and a signature mailbox frame comprise our "Scrollwork Garden Collection". 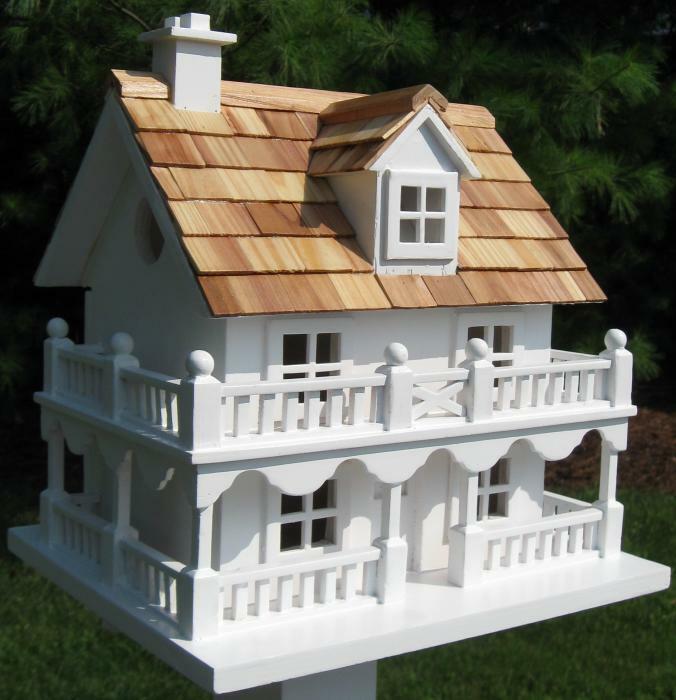 Each of our larger bird houses and bird feeders can be complimented with a dramatic pedestal that will perfectly match and support the home. The Cape Cod Cottage and Honeymoon Cottage are equipped with a decorative bracket for easy mounting. Wrens, Chickadees, Finches, Nuthatches and Titmice will all be thrilled to find these bird dwellings equipped with removable back walls, unpainted natural interiors and non-toxic outdoor grade paint. Topping off our pieces is a western red cedar shingled roof that will patina to a silvery gray color with sun-bleaching.